At Gearheart & Otis, LLP, our commitment to helping workers injured on the job isn't just a slogan. It's the way we run our practice. We are advocates for our clients who need our experience and expertise in the law to get them the best results. We have more than 60 years of combined experience representing workers compensation clients, from initial investigation through negotiation, trial and appeals. Cases are usually handled on a contingency fee basis (no recovery, no fee). Our staff is all union. We are committed to workers' rights! Our record of trial success and favorable settlements for our clients speaks for itself. From the time we accept a case until it's resolved, we dedicate the resources required and offer the support necessary to obtain just compensation for our clients. The law can be a frightening and complicated thing. Having experienced, knowledgeable and aggressive legal representation is critical to success, and that is precisely what we are all about. Our Firm has been protecting workers for more than 20 years. Our attorneys have more than 60 years combined experience in Workers' Compensation. You have devoted your skills and hard work to your job. If you are injured on that job, you deserve compensation. You are entitled to workers compensation for an injury or illness that you sustained at your workplace or at a work-related activity, regardless of whether it is directly connected to your job. Even if your employer was not negligent or otherwise at fault, you have a right to workers compensation benefits. Assertive workers compensation attorneys at Gearheart & Otis, LLP in Pleasant Hill fight for the compensation injured workers rightfully deserve, including: -Compensation for permanent disability -Dependents' recovery for worker's death -Temporary disability payments while you are off work to recover -Medical Treatment for your injury Related Claims: If you suspect your injuries were caused by the negligence or legal fault of someone other than your employer, seek legal advice regarding whether you may have other legal remedies in addition to workers' compensation benefits. At Gearheart & Otis, LLP, we will analyze your case to determine how you can recover the best possible compensation. This may include referrals to attorneys that can work with us to assist you in related legal claims. Pursuing a workers compensation case: All types of legal cases have time limits. If you are denied workers' compensation benefits or there is an adverse decision by the insurance company or employer about your case, there are strict time limits to take action or you may lose all of your rights. Even when benefits are provided, failure to take legal action may constitute a waiver of some types of claims. It is very important to seek legal advice before you request a so-called "QME" panel or select a QME physcian to evaluate your case, if possible. Our attorneys have more than 60 years of combined experience handling the rigid bureaucratic process of appealing to the California workers compensation board. -Listed in "Best Lawyers in America" 1999- present. Mr. Gearheart has been appointed as a Judge Pro Tempore, Workers' Compensation Appeals Board. In that capacity he occasionally assists the W.C.A.B. by sitting as a temporary Judge. Mr. Gearheart is a frequent speaker before the California Applicants' Attorneys Association, labor unions, bar groups and other organizations. He presently serves on the Board of Directors of the California Applicants' Attorneys Association and as Co-Chair of its Regulations Committee. 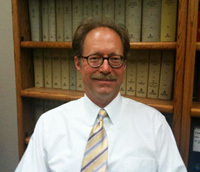 He has succesfully litigated many appellate cases (see appellate cases section). Arbitrator, Workers' Compensation Appeals Board. Judge Pro Temp, Workers' Compensation Appeals Board.